What’s a positive minded person to do? If you don’t have access to deflector shields from Star Trek, a cone of silence from Get Smart, or simply a copper pyramid to place over your head to block all these negative thoughts and words, simply climb into an imaginary ZORB™ and kiss the negativity good bye! The point is that every day we are bombarded with other people’s feelings, fears, and past experiences. We may be fighting our own feelings, fears and doubts at the same time. The trick is to find a way to protect yourself, keep your energy up, and even raise your own energy and positiveness so you are radiating to everyone around you. Before arriving at work (or visiting with people I know to be generally negative), I imagine climbing into one of the ZORBs and being completely safe from everything in my environment that could bring me down. But this virtual ball lets me see and hear everything around me and respond. According to Don Miguel Ruiz in the The Four Agreements , and others in the self-help arena, what people push out to you and others is simply about themselves and projections of what they are feeling. So, be prepared tomorrow when you go out into the world. I promise, you’ll catch yourself smiling when someone begins a tirade of complaining and it just bounces away. Plus, your smile will just irritate the crap out of them. 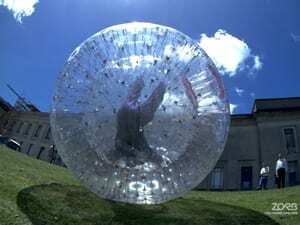 Excuse me, now, while I bounce on down the road in my ZORB!